bowling for soup at kapiolani coffee shop. wow, well, what can i say? i wanted to go bowling, i wanted a bowl of soup, so the natural choice was kapiolani coffee shop in the kam bowl in kalihi. did a round of speed bowling (10 frames in just under 20 minutes), got some oxtail soup, fast(about two minutes from order to table). eight big pieces of meaty falling-apart tender oxtail in a clear but rich broth fragrant with onion, star anise, ginger, chilis, and fresh coriander, served with two scoops of rice and as much fresh grated ginger as you can handle. 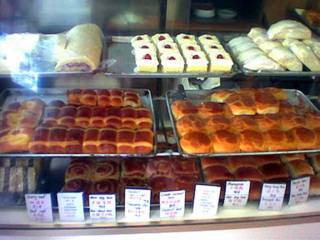 breakfast at ruby, and the search for manapua. we stayed at a hotel in downtown honolulu this time around, mainly because it was pretty easy to get to the freeway/airport/leeward side. a nice aside was that it was walking distance to chinatown, so i had the chance to explore a little. 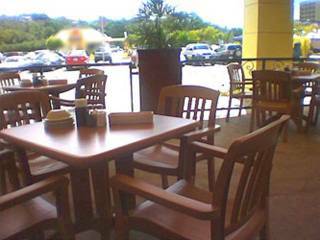 i've only eaten at one or two restaurants in the area before--indigo and some of the stalls in the maunakea market place--and i didn't know anyone who spent a lot of time there, so my mom and i just decided to go to wherever looked good. 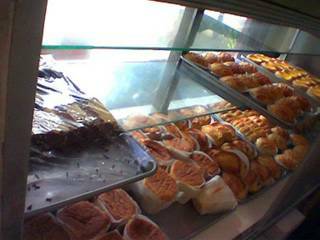 we looked for a place for breakfast (a meal we usually don't spend much time on) because we didn't know when we'd get to eat later in the day, as we would be visiting my uncle in a hospice in ewa beach. 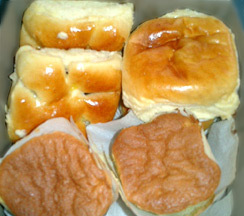 also, we were on the hunt for manapua, a local favourite. 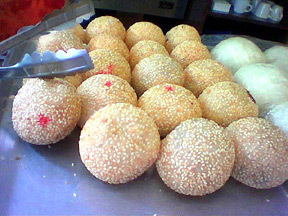 manapua are chinese-style buns, either steamed or baked, filled with savoury items, most commonly minced char siu (roasted pork). 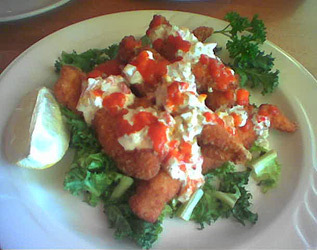 the word is thought to be a contraction of the hawaiian mea ‘ono pua‘a--"delicious pork thing." when i was growing up, they were relatively easy to find, but in recent years, i've had trouble finding a particular variety i'm fond of--a soft baked bun with a brown "hash" of finely chopped roast pork and gravy. one of my uncles with us, who had spent a good portion of time in indonesia, ate most of his breakfasts at the malaysian places in the marketplace food stalls, but sometimes joined us for breakfast, which you can see, wasn't exactly american-style. my mom and i mainly had jook or congee, chinese style rice porridge, which can be flavoured with almost any ingredient. my mom stuck to a seafood rice porridge, which had nice fat pieces of sea bass, a couple of shrimp, and a bit of squid. i tried a couple, including the one pictured below, sampan, which had bits of everything in the kitchen--tripe, pork, jellyfish, squid, and goodness knows what else, then topped with fried rice noodles, crushed roasted peanuts, and green onions. in some places they precook the congee as a water-based rice porridge just flavoured with salt, then just dump whatever ingredients in before serving, but here it seems if they spent some time adding broth along with the requested ingredients and letting it simmer a bit to develop a richer flavour. it would arrive at the table steaming hot, and fragrant. we also tried the crispy gau gee as an alternative to the fried bread or fried dough sticks often eaten with congee. i found out gau gee is a popular dish, but i'd never had it; it's basically a pork-based dumpling, but instead of a ball, it's a small rectangular pillow. 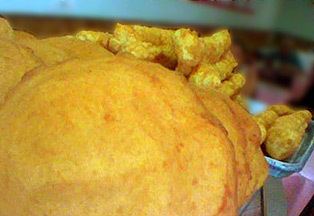 i saw it offered mostly as a dumpling in noodle soups, but also as a fried item. the wrapper also seems to be slightly thicker than an wonton wrapper, but i imagine it could do as a fine substitute if you were to make them at home (which i intend to do). one morning, i had the wonton soup, which also had noodles and a lot of fresh choi sum (a kind of flowering cabbage related to bok choy) and my uncle took a shine to the roast duck on rice, which also had choi sum. the duck was flavourful, just slightly too fatty, not too salty, and the skin retained just a hint of crispness. i don't recall the exact prices of anything, but the rice porridges ranged from $3 to $5, and the duck was just over $5. a bargain meal, especially since the portions were large enough to tide us through 'til late afternoon! i was in honolulu for two weeks, counted two starbucks within 50 yards of each other near my hotel, and three starbucks in ala moana shopping center--one on each floor, in different sections. 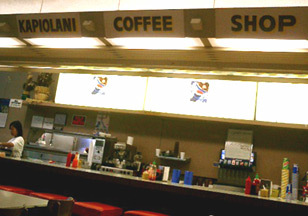 i think i may have missed one in the makai food court though. i thought manila was bad. at least in los angeles they space them a little further apart than that. i stopped into two of them in the mall, but didn't get coffee in either; i was looking for something different, like in the manila and tokyo stores, where they have frappuccinos with coffee jelly or matcha frappuccinos. 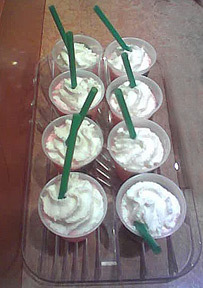 i tried something called a tazoberry frappuccino, a black tea based slushythingy which tasted like a discontinued foremost popsicle--raspberry, grapey, limey--not bad but not natural, and the macadamia nut bar, which was nut-tastic--shortbread crust, brown sugar pecan pie-like goo, and an layer of chopped macadamia nuts that was as thick as the crust. mmmm. if you are in honolulu and have a need for it, they will be carrying a hawaii-themed duetto card (the in-house debit card) starting july 12th. cute and useful souvenir, i would imagine. kawaii alert! girls with bacon turbans and shrimp head boys! aieeeeeeee! the characters above are as follows: E.B.I., lady bacon featuring T, strawberry chocolate, milk chocolate, and harshed potato. !!! all have their corresponding snack cookie, which you can easily imagine. i'm a little disappointed by the strawberry chocolate and milk chocolate character names, but i imagine they actually have the best-tasting snack item. E.B.I. the shrimp-headed boy is sort of amazing, but the girl with the bacon turban and habañero head win hands down in terms of sheer nuttiness. has anyone out there tasted these? i'll trade you a bag of matcha corn for a packet of lady bacon! when i was picking up items for the tofu salad the other night, i noticed a new item in the sweets aisle, tohato brand matcha (green tea) caramel corn. of course i had to buy it! 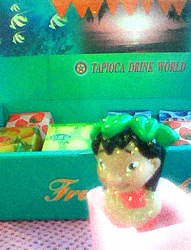 cute packaging, lurid lime coloured bag, caramel, green tea--it's a done deal. if you are familiar with tohato caramel corn, you'll know it's not like the american idea of popcorn with a toffee-like coating; instead it's a corn puff of the hot-air extruded variety (you will find out some day how much hot air extrusion fascinates me, i'm sure), similar to a chee-to type puff, with a barely there caramel coating--they literally melt in your mouth. the matcha caramel corn is basically the same product, only with a dusting of powdered green tea on top. it looks like a fat, dead caterpillar and tastes like a starbucks green tea frappuccino--more milky than tea-y, sweet, and oh yeah, milky. there isn't a bitter aftertaste like some milky tea products have, but i don't know if you could scarf these down quickly. still, it's a nice change from the usual tohato lineup. i checked the website but i couldn't tell if this is a permanent item or just a seasonal one; i suspect the latter. so if you want to try it, buy it now, before it disappears. 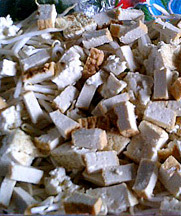 there is another potluck lunch at the clinic--mrs.arguelles' birthday celebration--and i lack the desire to do anything more complicated than opening a can, so i'll prepare an old standby 'feed-a-crowd' recipe of tofu salad. 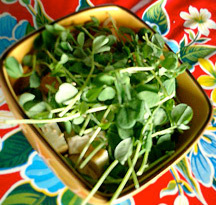 the first time i had this salad was in honolulu a few years ago; the original salad was comprised of giant handfuls of watercress, layered with tofu, tomatoes, and maui onion with a shoyu(soy sauce)-sesame dressing. 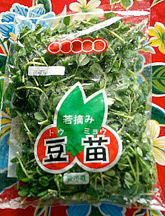 i've had it and made it in various incarnations according to what was fresh or merely what was in the fridge and cupboard: with any sort of sprout, any sort of tofu, sometimes tinned fish (or even lomi salmon--yum! 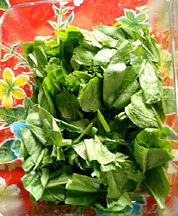 ), various lettuces and greens. the dressings also varied, but basically have a soy sauce base. today's salad layers will be items i found at the local japanese market on my way home last night: radish sprouts, cherry tomatoes, bean sprouts, canned salmon, spinach, and toasted white sesame seeds to thow over everything. i'm opting for a simple dressing of soy sauce, and toasted sesame seed oil. generally, i stick to firm tofu cut into cubes because it soaks up the dressing nicely without diluting it too much, but they didn't have any at the store. 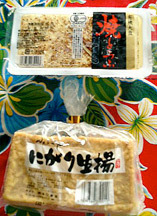 i decided to use two types of tofu: a semi-soft tofu that is lightly grilled to hold it together, and a fried firm tofu, both cut into small chunks. there are, per my normal mode of operation, no amounts listed, just add whatever amount sounds good. the only real advice i have is to drain or pat dry any or all ingredients! 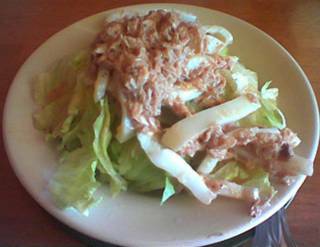 the dressing is simply made by dumping soy sauce and a few bonito flakes in a saucepan (sometimes i add a bit of sugar if the soy sauce is particularly sharp), bring to a boil quickly, then take off the heat. add a little bit of sesame oil, a little more peanut oil or some other neutral oil, and mix well. 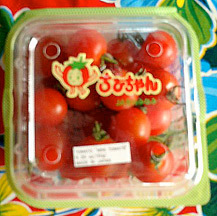 the tomatoes i use are often acidic enough that i don't add any more acid to the dressing, but i think i nice squirt of fresh lemon juice, calamansi, yuzu or even grapefruit juice wouldn't go amiss. 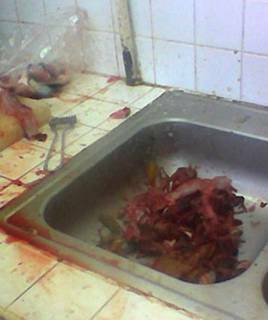 anyway, don't dress the salad until you are ready to serve it. 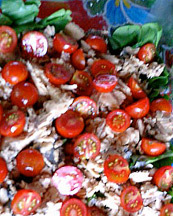 what i like best about this salad besides the ease of preparation, is the texture--cold and crunchy sprouts, soft and creamy tofu, bursting tomatoes against the tender spinach, all playing against the salty dressing, sweetness of the veg, and nuttiness of the sesame. and anyone who likes asian flavours likes this salad--even the keikis! hanging out in honolulu. eating too much. mostly divey places or fast food, but not hanging out with a smart dining crowd. peeeeeecky. still, got some good grub in me, brah. anyhoo, check out onokinegrindz.typepad.com in the meantime. i'll start posting again next week. kawaii alert! mooning over my hammy!! Get your own at Hamster's Noodlebar! what is it about my camera phone that makes everything look like i took the photo in the seventies? gotta get a real camera. 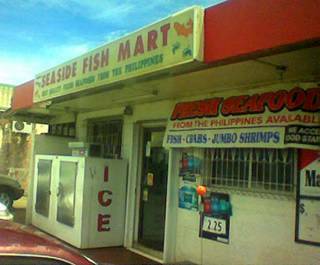 seaside mart, which is landlocked. 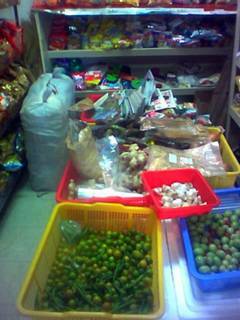 it specializes in fresh seafood and filipino goods, and is packed to the rafters with stuff. sure, he could move to a bigger space, look more like a chain supermarket, but why? yeah, i'll take some of that. if you kick something over, it might be something you really want. need some calamansi? got it! can of binagoong na baboy? take two! fita, skyflake, or sunflower crackers? take all three! 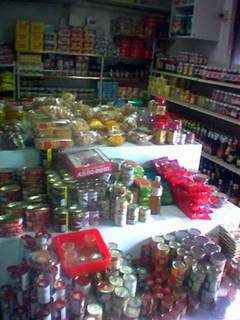 the front of the store is laden with canned goods, boxes, local handmade treats, candies, magazines, beauty products....it's like a crazy treasure chest, filled with stuff you can eat. in the back, there is the fish room, where all the seafood is laid out on ice. 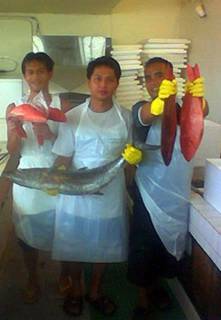 he's got reef fish, bangus, hito, shrimp of all sizes, crabs, and other assorted nemos. there's a bunch of strapping guys back there who'll help you out if you don't what anything is, and will gladly (and i mean that) de-gut and de-scale anything that needs de-gutting and de-scaling. anyway, wander over. say hi to jay, and if you tell him you love him, he'll give you a big discount (no, really). this is my cousin jay. no, not the big bilious green thing, but the guy holding up the big bilious green thing. the big bilious green thing is langka--otherwise known as a jackfruit. a relative of the breadfruit, it originated in the ghats of india, and quickly spread throughout southeast asia, and the pacific. it is not related to the durian, which i kinda find hard to believe, as both are highly fragrant giant stinkin' things. although the jackfruit is more of a sweet, flowery stink as opposed to the rotting garbage stink of the durian. a jackfruit can grow up to 80 pounds and 36 inches in length. the flesh of the jackfruit is pale to dark yellow, wrapped around brown ovoid seeds, and has a sort of sweet apple-banana-y taste with a jasmine finish. 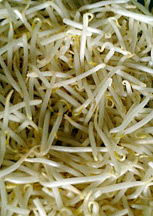 it's used in desserts, stewed, fried, baked and boiled. i have no use for it, which is why the specimen pictured is with jay and not on our kitchen table. 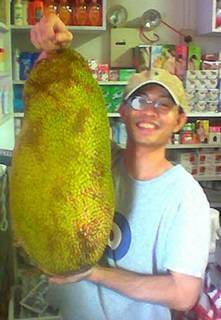 if you need some jackfruit, go to seaside mart and jay will sell a chunk to you. so the whole boba thing sort of came and withered here, but we're still left with a bunch of boba places. 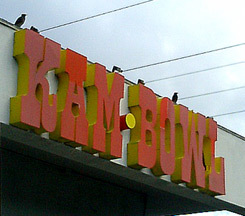 it's sort of equally divided between boba shake-centric and boba tea-centric joints. 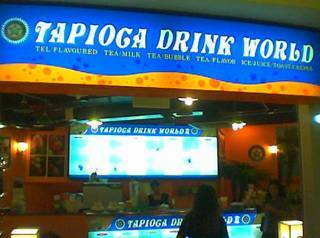 i prefer tea, and my favourite place is tapioca drink world, a taiwanese style boba pearl place. tdw at agaña shopping center. man, it's bright in here. at first i was a little put off because they use instant coffee granules, but it has a good coffee flavour, not acidic, and it packs a nice caffeine punch. 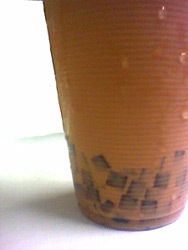 they always give a healthy portion of the chewy tapioca balls, and equal amounts of the gel cubes, which quite honestly don't taste like anything but add lovely texture. a couple of the shops also have crepes and toast on the menu. yes, toast. one day i will report back on that. eh, brah, where's my tip?! i don't usually have a lunch break until after 1:30, which doesn't leave much time or choice for me if i want to eat someplace un-diner-y and fastfoody. one of the regular places on rotation is capricciosa, a japanese chain of italian restaurants, albeit italian food for asian tastes: ital-yen. 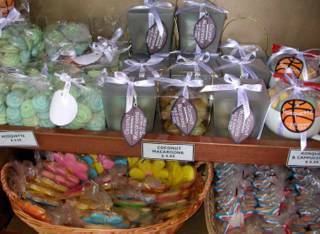 the newest link in the chain is at the renovated agaña shopping center. i currently like this one the best as it is casual, less crowded, and bigger than the other locations (pacific place and the royal orchid). it also has a very nice patio dining area, even though no one ever eats there because duh, it's outside. it's hot. there are bugs. and it overlooks a parking lot. but it's still nice. maybe it's nicer at night. 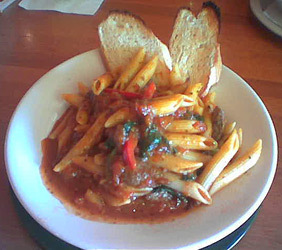 the prices can scare people off--the average entree price is $15--but the portions are huge--one serving of pasta can easily serve four normal people, or two guambats (and a microphone). you can have a very substantial meal of several courses for under $25 for 2 (or 3. or 4. depending on how many stomachs you have.). the restaurant is beginning to introduce lunch specials that are smaller portions at just a penny under $10, so you don't have to be tempted by the heaving mounds o' carbs. of course, we were totally stuffed, which left no room for dessert. if you go, you should try the pumpkin pie, which sounds odd, but is really, really good. agaña shopping center, town house side.